I will focus on Acidanthera, Vibernum and Digitalis in the journal this week! Acidanthera has the common name Peacock Orchid and is technically a Gladiola variety. Make sure you take a whiff of this delicate-petaled flower because it has a subtle, sweet scent that’s really nice. 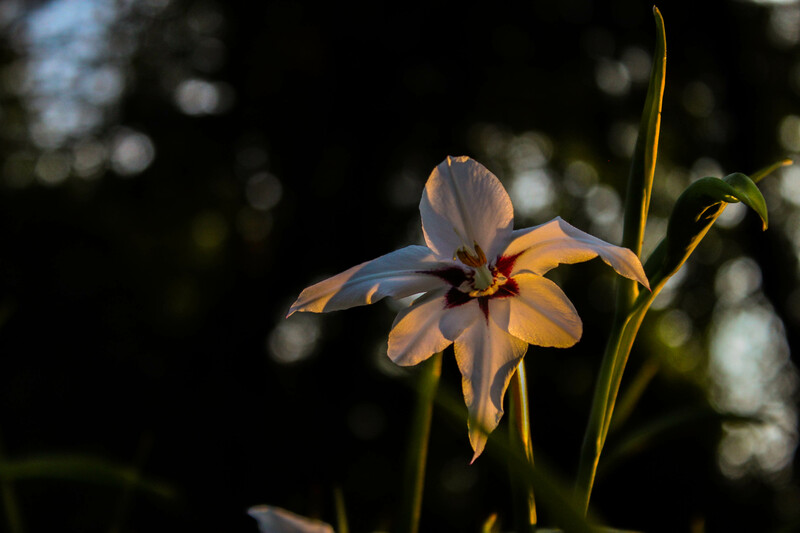 Acidanthera, just like any other Gladiola does not overwinter in this zone, so the corms (similar to bulbs) have to be dug up at the end of the season and and re-planted the following spring. (since their corms are fairly inexpensive, we let them freeze/rot in the ground over the winter and then buy new corms to plant the following season) When you see these growing in the field you can immediately recognize its similarity to Gladiolus because it grows from a crunchy, thick, sharp stalk. When the open flowers on your stems start to die, you can pull off the dead head and observe another bud on the same stalk start to open. In previous years, I’ve experienced difficulty in getting this thick, green stalk to bloom, but this season, we moved their bed to a new spot in the field with better drainage and they are blooming like crazy! 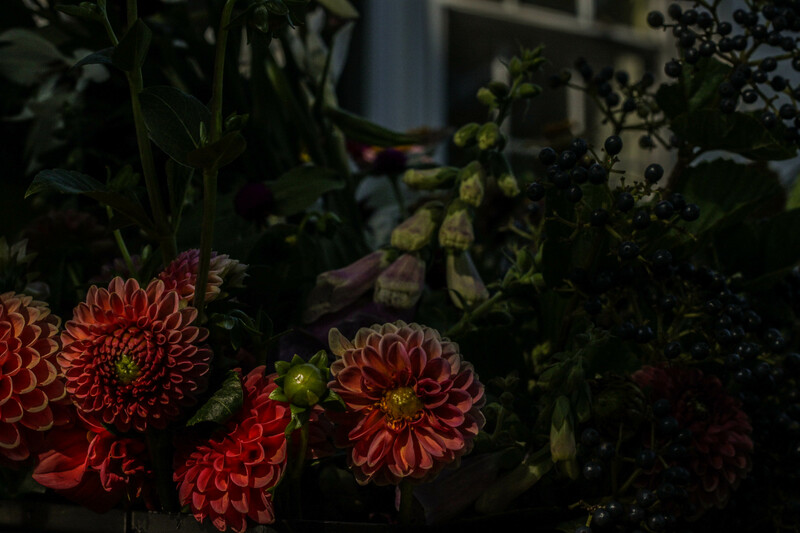 I really like to use these flowers to design with because they have an upright, straight quality to them as well as a gentle, sloping shape at the place where the stems form flower heads. It’s also just nice to add this to the list of flowers that bloom in the late-summer heat. 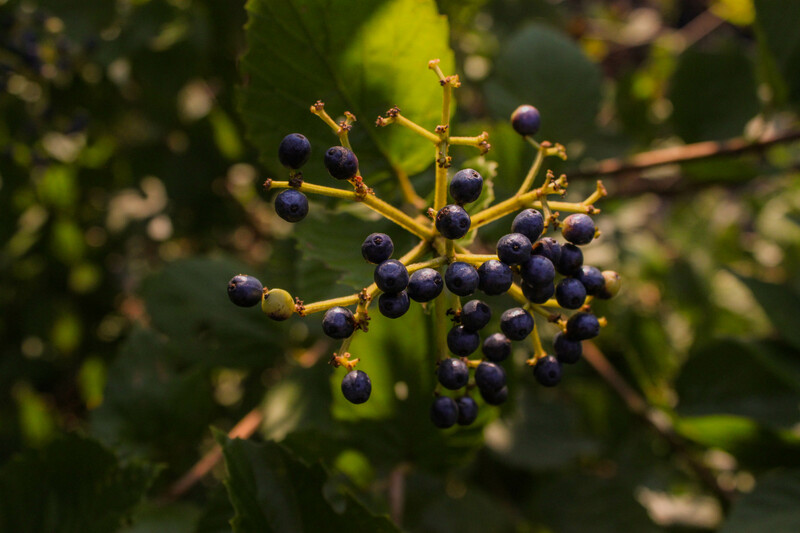 This particular Viburnum dentatum (“Chicago Lustre”) took many years to get established before it started making these beautiful blue berries! In the spring, this variety of Viburnum makes a soft, spread-out head of white flowers and during much of the rest of the year, it has a lovely, green foliage to offer. Towards the end of summer, uncut flowers transform into these beautiful dark berries that look delicious, but shouldn’t be eaten raw! The birds do seem to love them though, so now that the berries are in full bloom, we may need to start harvesting them all before they disappear. There are hundreds of varieties of Viburnum and overall, this plant is a really great perennial to invest in because of its combination of fragrant flowers, textured foliage, and berries (in some cases) that can be cut and used throughout the growing season. 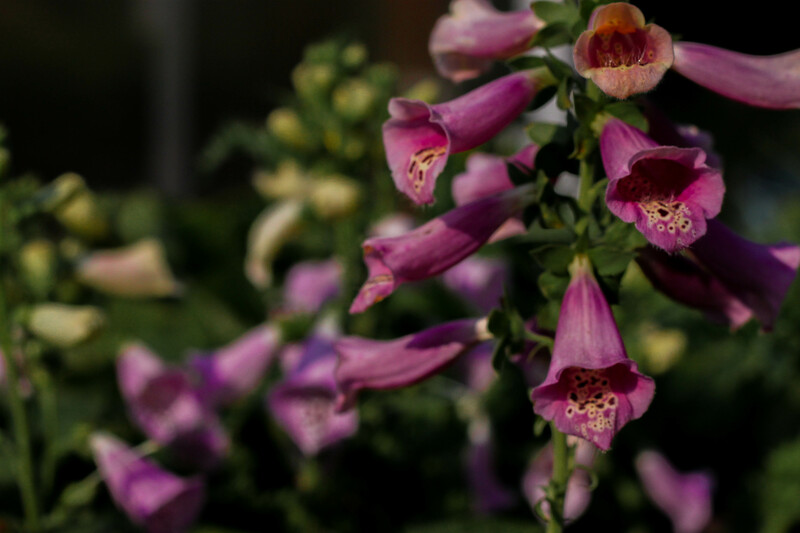 Digitalis is commonly known by the name of Foxglove and the variety in your bouquet is called “Foxy.” Most varieties of digitalis are biennials and produce only foliage the first season. 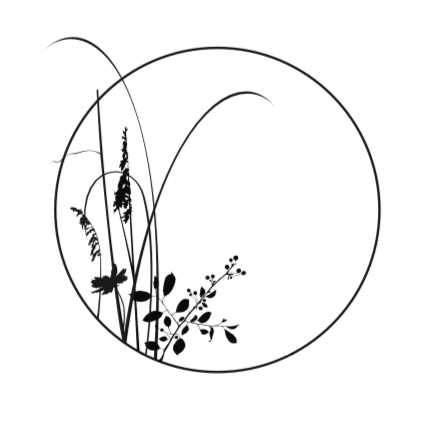 The following season brings about tall stems and flowers! For this reason, it feels really special when it finally blooms the second season after an entire season of just making low, thick foliage and no blooms. Unfortunately, this flower’s unique beauty lies in contrast to its toxicity and should definitely not be ingested in any form. Despite its toxicity if consumed as is, there are active compounds extracted from this plant’s second year of leaves, that are then used in medicines to treat congestive heart failure and irregular heart rhythm. Still, there seems to be a fine line between useage as a medicine for heart problems and toxic levels of digitalis. Don’t let the facts scare you away from liberally using this flower to design with because it’s descending bell-shaped flowers on stems that sometimes bend and reach in the nicest way, are one of my favorites!